Thank you for choosing Elegant Home for your Home and Garden Décor! 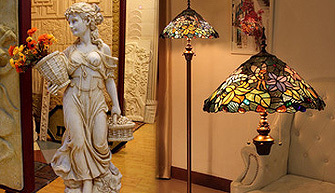 Tiffany-Style Stained Glass Lighting, Fireplaces & Window Panels, Area Rugs, Furniture, and one-of-a-kind home accents and gifts. We bring our showroom to you so you can shop from the comfort of your home. We hope you find our products ​fresh, lively, totally unique inspired creations for beautiful living and your source for inspiration! We are a small family owned business so our reputation with our customers is vitally important to our success. As sellers on eBay, we rely on positive feedback ratings to represent our business to potential new buyers. We will do anything to make your purchase a positive experience. Your 5 star rating would be GREATLY appreciated! When you buy from this seller you're supporting a small business owner who is working to better their financial situation. Our success is because of our customers. We listen, improve and constantly review all our products so we remain market leaders in what we do. Shop with confidence. We are experienced sellers on eBay for over 15 years. We are backed by quality Manufacturers that have been in the industry for over 50 years. All items are brand new, first quality, and come directly from the manufacturer. We strive for 100% customer satisfaction and will settle for nothing less. We pride ourselves in attention to detail. Every item in our store has been hand picked as being exceptionally beautiful and unique to create a superior shopping experience. Our collection of themed products, including angels, birds, animals, from the coastal/nautical to floral, tuscan countryside, and spiritual are unparalleled. Create a warm and inviting living space while bringing artistic style into your home! Offering the perfect balance of art, style, function, and inspiration, our passionate customers are eager to surround themselves with our unique and one-of-a-kind objets d'art. With our innovative and provocative designs, our selection of products is valued by art collectors and prominent interior designers. Get the garden of your dreams with our collection of garden décor. Show off your style and accent your garden path and add the finishing touches to your landscape with unique art. Create instant serenity with our fountains and angel statues, spiritual statues, or with birds, hummingbirds and butterfly themed art. We strive to always provide the best quality products & reliable friendly service to our valued customers. If for any reason you feel we have not earned your 5 stars in any category please ​give us a chance to rectify the problem and earn your 5 star feedback. We are always willing to do what we can to resolve any issue and will work hard to make you happy and earn your 5-star feedback rating! We are happy to have your business and we thank you. Enjoy your shopping experience from us and we hope to see you back again! We are excited to participate on social networks including Pinterest, Facebook, and Twitter. Click on the links below to view our profile on each network. Stay up to date about our company, our sales and our products. Find the latest info about our sites and products as well as content we love to share. Our profile includes many photos from the numerous products that we sell organized into boards to help you browse our products in a more visually engaging way.